How Social Media Could Harm Your Job Hunt! You’ve heard the urban myth about the candidate that was eliminated from consideration for a new job because the hiring manager searched for them on google and found photos of them doing something dangerous, or illegal… or just plain silly? Of course, you have. In today’s social media-filled environment, rumors like that appear frequently. Except it’s not an urban myth; it’s not just a rumor. If you apply for enough jobs in the marketplace today – someone will google your name, someone will search for you on Facebook, someone will review your LinkedIn profile. I used to do this all the time and I can guarantee that recruiters and hiring managers are doing it regularly. One of the main reasons companies use social media in the hiring process is to get more information about (or screen) potential candidates and suss out their likelihood of fitting in with company culture. That’s great if all your posted content happens to be about how dedicated an employee you are, how much you love to work and how highly skilled you happen to be. Unfair as that might seem, don’t give them reasons not to give you a chance. 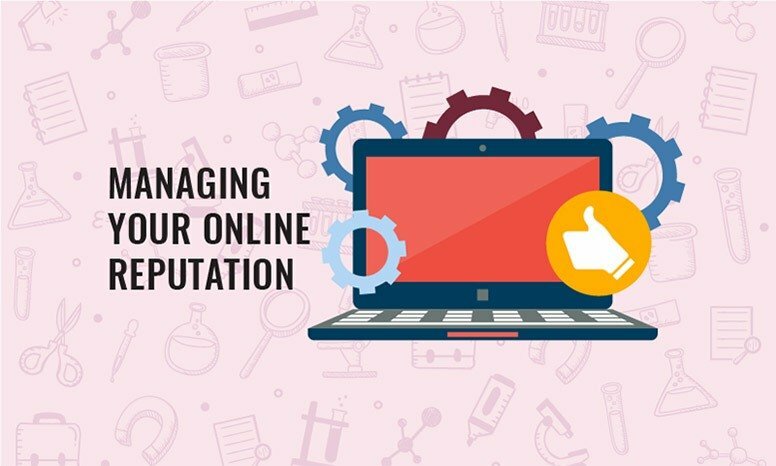 Let’s take a look at how you can manage your online reputation to make sure this doesn’t happen to you – in just 4 easy steps. This is typically where anyone searching for you will start, so you should do the same. And actually, you should be doing this on Bing and Yahoo as well. If you find something that you’d rather someone else didn’t, now’s your chance to take action. Chances are, in your Google search, and social media profile you have will have appeared in the listings. But that’s not enough. For each of your social media accounts, you should log out and then search for yourself. This will show you what someone who is not a connection of yours will see. Check for postings, photos and personal information that you share – would you want a hiring manager seeing them? One particular thing to note on Facebook is photos you’ve been tagged in. While people are usually pretty careful about the photos they put of themselves on their own profiles, sometimes they are less cautious about the photos others post. To make sure you’re not associated with any less than desirable photos, make sure you’re not “tagged” in any. If you are, simply “untag” and the association to you will be broken. So you’ve found a few posts and a couple of photos that you’d rather a hiring manager didn’t see when considering you for their position. There are two main ways to tackle this – edit your visible content or have your privacy settings protect it. This is arguably the more extreme option. Because, unless your profiles happen to be full of genuinely offensive content, there’s not really a need to censor yourself in this way. You are absolutely entitled to your personal life and your opinions. If you do decide to take this route, take each of your social media accounts at a time and go back through your posting history. Delete anything that you think might harm your chances if seen by an employer. A good test for this (although a little dated!) is, would you be embarrassed to see this photo or see yourself quoted as saying this on the front page of a national newspaper? The time most people would choose this option is when having a publicly viewable profile could be of benefit to their job hunt. LinkedIn is a good example of this – to have the greatest impact on your job hunt, people you don’t currently know have to be able to search for you and view your profile on this social network. The less drastic option, that still allows you to display all of your past social media content as well as to continue posting as you wish, is to adapt your security settings. All main social media platforms have various levels of privacy. These will typically dictate what can be seen by someone who isn’t a direct connection with you on these sites. To do this, log out of all your social networks again and search each one for your name to see what is accessible. If you can see things at this point, so can everybody else. A good example of this is that you might think your Facebook profile is private but non-friends may still be able to see all of your old profile photos. This is the sort of thing that a logged-out search will show you after you’ve made changes to your privacy settings. Of course, this option only works if you are careful about who accept connection-requests from. As soon as someone is a direct connection, they can generally see everything. If this is your chosen route, you might like to keep a close eye on who you connect with. Finding something unsavory is bad for your chances but a potential employer finding nothing doesn’t improve your chances. This is why it can be particularly useful to have a ‘professional’ Twitter account and a LinkedIn account that is solely for professional networking. Maintaining a positive social media presence can be a great boost to a well-crafted application. Well thought out and considered input can really help you and this is especially true when you’re trying to prove you understand a new area or industry. If someone searches your profiles, take the opportunity to leave them with a positive view. Finding evidence of someone that is hardworking, well informed and committed to their goals is a powerful message – and that is a great online reputation to have.